Congrats on your successful challenge! I also love how you always create multiple versions each month. You definitely inspire me to be a better Daring Baker. 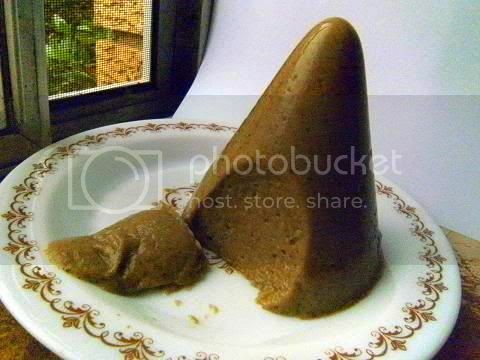 I love the shape of the inverted Shitake and Seaweed paste Panna Cotta but am wondering how did it taste? Had you had it that way before or were you being completely imaginative in your flavor choices? Either way, very daring. That three fruit panna cotta looks so wonderful. You really take some amazing risks with these challenges, and they seem to always pay off beautifully! Thanks for the helpful information, and the wonderful support!! Amazing as always, Audax. I wish we could buy the larger portions of gelatin here in my little town. I'm going to keep my eyes open and see if I can find it next time I'm in a larger city. It looks far more convenient than the little packets I have to resort to. I love your flavor combos--you're so inspirational! You always go above and beyond with the challenge. 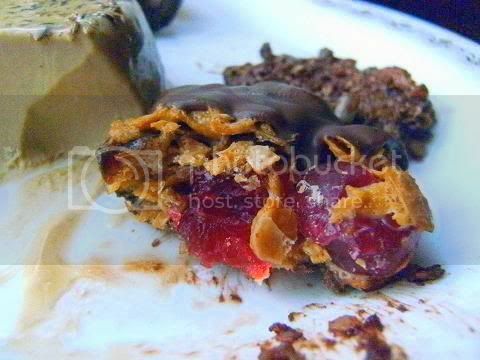 I love the florentines, those cornflake ones with the cherries are what I picture when I think of them. Oh and that gelatine conversion...eeeek lucky I did advanced math when I went to school. oh, I KNEW I should have consulted you before attempting to play around with gelatine! 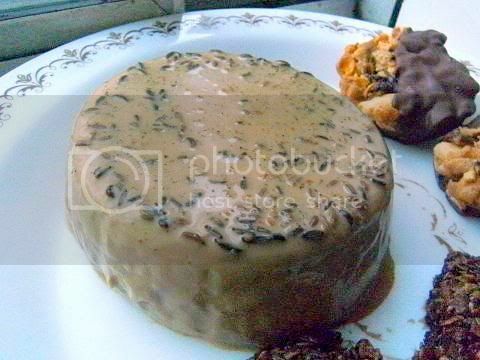 I particularly like the look of your coffee cardamon panna cotta and the chewy florentines. How long did the florentines last?! I'm assuming not long. Thank you, Audax, for all your helpful information and support during the challenge, for all the detailed information and congratulations on your many faces of this great challenge! Great that you did a savory version, you were so creative! Hats off to you! Thanks for all the great tips Audax. That one about steeping the flavouring for 48 hours really helped boost the taste of citrus from kaffir lime leaves in my panna cotta. 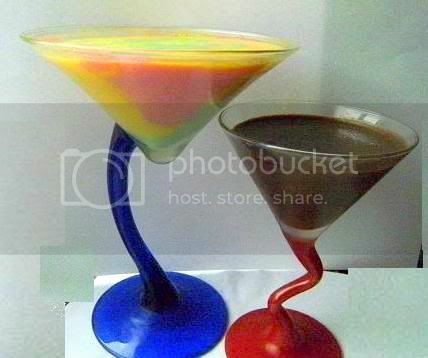 Love the psychedelic colours in the Martini glasses! Actually to correct you, mango can certainly be used in panna cottas. I've made many successfully and had no problems at all. Oh my goodness, what an amazing collection of panna cotta. 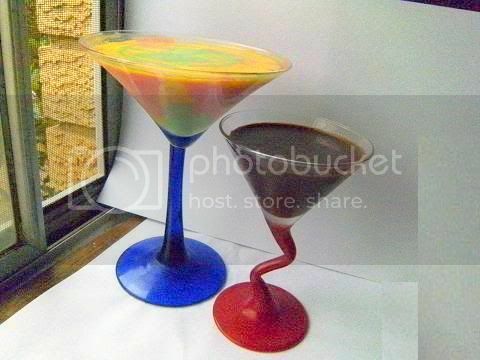 I adore the look of the fruit one, great colours to go with the funky glass. 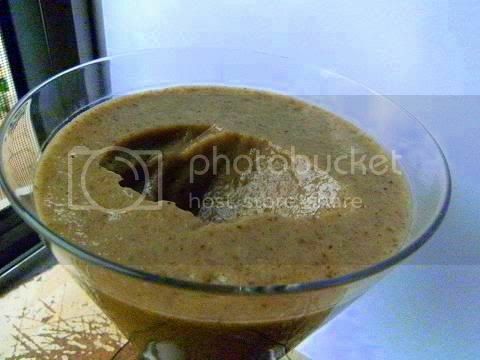 Mushroom and seaweed panna cotta? In awe! Your information was invaluable, as always, and I for one am very thankful for all the knowledge and information you share with us. I'd love to taste the spicy coffee cardamom one and I love those funky glasses! So creamy and delicious, loved your versions and your cookies have turned out perfect, crisp and yummy. I loved the way you presented. Audax, as ever, your creativity amazes me. I want to borrow those lovely cocktail glasses with the crooked legs - tre cool. Cool funky glasses Audax! And wowee, so many flavours although I must say mushroom and seaweed would not have been my first thoughts when making panna cotta. You are so creative. I was wondering about the challenge Florentines because I've only ever seen the cornflake ones too. Well done on another great challenge. As you usual, I like the way you make magic by combining flavours. 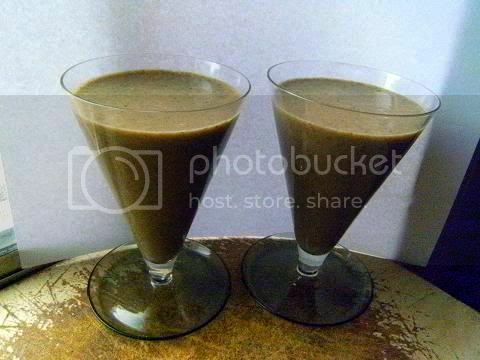 Coffee, cardamom, cumin, caraway with chilli and chocolate sounds very interesting. Have to hand it to you how you meticulously do research for every challenge. 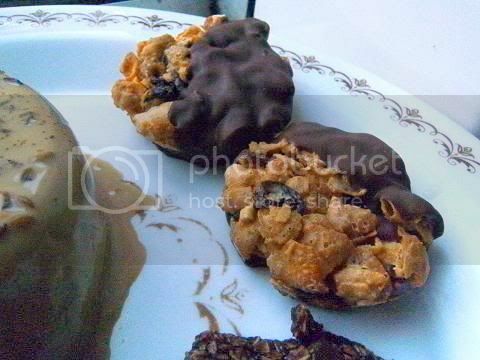 A crispy and a chewy florentine--wow! Love cardamom--great job! I love how you swirled the lime, pomegranate, and lemon panna cotta, and your cherry Florentines look yummy! I love the attention to detail with every challenge you undertake & it clearly pays off. These are absolutely stunning. The interior of that first panna cotta looks so scrummy - the most perfect, creamy texture. Yum! That's probably my favourite flavour too with the coffee and the spice. Mind you, I'm also quite intrigued by the mushroom and seawood! So many delicious sounding varieties of panna cotta! i could happily make a different flavour every day of the week, but there's a new challenge on its way! 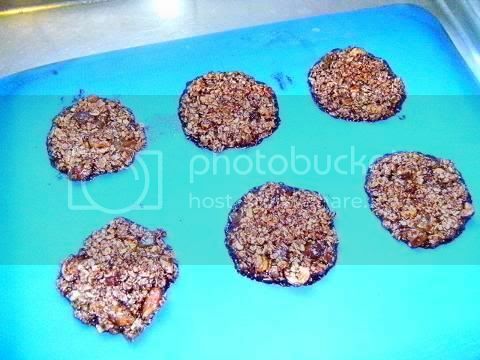 I must try the Australian florentines, as I remember a cornflake cookie from childhood and would love to recreate that taste. Great job this month, and fabulous information about gelatin and its substitutes. Everything here sounds so good, but especially the cherry chocolate florentines! Splendid work, as always. Thank you for your comment and advice regarding agar powder. I am excited to give it another go! Oh, my did you get creative! FABULOUS! Spicy cardamom? Licorice? Chewy florentines with cherries? You rock!!! You are definitely the definition of daring. I am not sure I would like all the flavor combinations you do - but I would certainly like to try them to see. Audax, your post is an incredible tutorial and has a wealth of creativity! Thanks for being such a great teacher and fellow DB to all of us. Congrats! This is an awesome post. Not only because you tried very innovative panne cotte - the coffee and spice one sounds coffeelicious :-), but also for the information you provided. 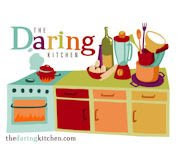 I am totally fascinated by the chemistry aspect of cooking (especially baking) and got really thrilled to read the explanations about whipping the cold cream. Very informative and interesting! Terrific look panna cotta and florentine cookies. The glasses you used are cool and funky! So thorough and detailed! I love it! On top of that, your panna cottas look gorgeous and the flavors sound fantastic! Whoo hoo! Also, I so want to make cornflake florentines next time! Ha ha - the extra mile, as always - wonderful. Mushroom and seaweed?? Amazing. I think my favourite is the three fruit one - it just looks amazing! Wow, such variety, Audax! I don't know that I am ready for the savory version, but the three fruit sounds and looks fantastic. Nice job on the challenge! Audax, I learned a whole lot about Gelatin, thanks to you! Also your flavor combinations are absolutely one of a kind and you have me in awe every challenge. Very well done! You're always an inspiration, Audax. Love all of your beautiful interpretations! Everything you made looks wonderful! 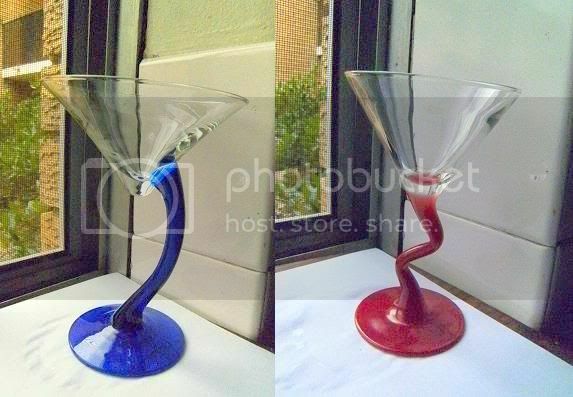 I really love the ones you made in the martini glasses! WoW Audax you are so professional, all the information is so useful, wonderful job!!! You really are THE Daring Baker! Such a wonderful and detailed post with so many fabulous ideas. I have been wanting to bake something with liquorice and your panna cotta idea is just fabulous. wow, this is a cpmplete panacotta tutorial. Very impressive serving in glass! Audax, your tips always help me out so much every challenge, and this month was no exception :) I love the sound of the spiced coffee panna cotta, such interesting flavours. And I'm definitely curious as to how the savoury panna cotta tasted..
What great creations, so original! I really love your take on that challenge. You are always so creative! 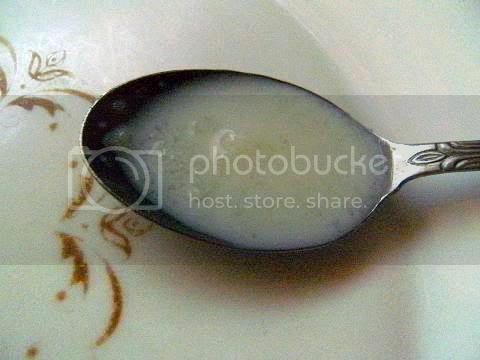 Oo my my..thatz the most innovative Panna Cotta i have ever seen..Seaweed Panna Cotta.. Appreciate ur patience in creating multiple version of the challenge. Thank you so much for sharing your knowledge with us. I am amazed by the amount of information that you provide to everyone, and how willing you are to help us all to grow and learn as cooks and bakers. Really interesting and innovative panna cottas, too! You are so organized. As someone who always posts right on, or more likely after, the deadline I am always stunned by the time you take to fully research the project and to create numerous, completely original variations. Great work again, Audax! You are genious always.. absolutely love all the flavors and detailed post.. you are fabulous. Wow you really did a great job with all the different versions of the Panna Cotta and cookies. And, shared so much info. Thank you! Audax I simply LOVE your posts, I adore these combination of flavors (the only one I don't know is caraway)the martini cups look wonderful I love the colors and the cookies look delicious too. Wow you made so many variations! 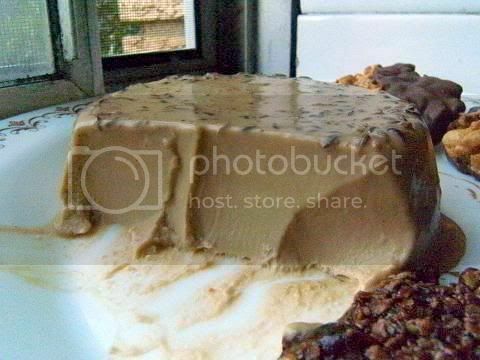 I love how your unmolded Panna Cotta looks! 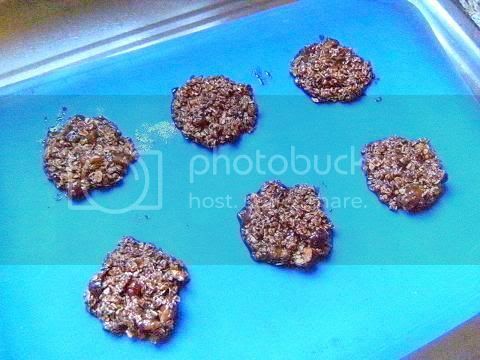 And the cherry chocolate florentine cookies look great too, I love that combination! The cornflake/cherry Florentines sound so good! I love all your variations, even a savory one--WOW! I love all your version of panna cotta and florentine cookies. thanks for the tips with agar agar it was a really help for me. i enjoyed making them. Great post! Love the flavor combo on the cardomom & coffee. 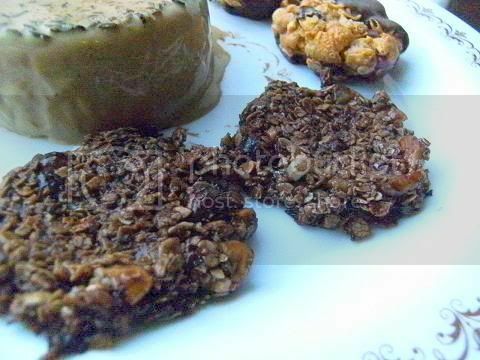 Your florentines look amazing! Great job! 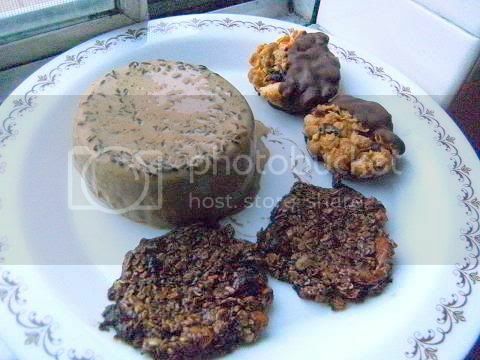 I just love all of the different ways you prepared the panna cotta... And, those cookies look wonderful! I especially like the chocolate and cherry ones. My God, Audax, I'm trying those cornflakes and cherry florentines TODAY!! They look fabulous! Wonderful job!! 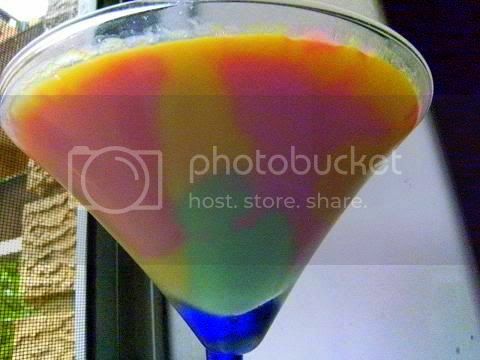 The coffee panna cotta sounds like a delight, and I love the psychedelic swirls on your fruit version! As usual, you are a true goldmine of information! The three fruit panna cotta looks delicious! I'm sure it tasted good too! I just love how in depth your posts are, thanks for all the advice! What an absolutely superb presentation, Audax. The lovely panna cottas and different types of biscuits. It's a work of art. Love all the flavor combinations you made both for the panna cotta and the florentine cookies! Great job as usual audax! Amazing! Next time I will have to try your methods. Aud..as always, you so rocked this challenge! I'm in love those glasses - they really showcase the beauty of your panna cottas! My fav is the three fruit - the colors are gorgeous pastel! Also love your florentines! Once again..thank you so much for taking the time to convert my panna cotta prep recipe for me. You made my life so much easier with your knowledge and patience! You made so many variations of panna cotta! I'm amazed by your ability and creativity! 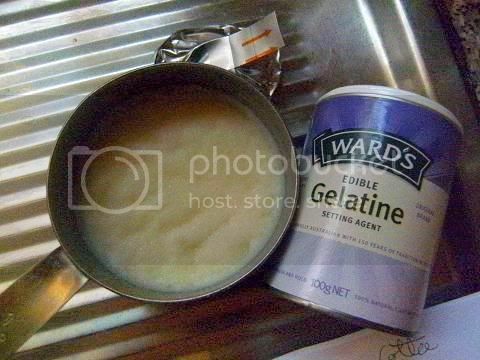 And thanks a lot for the detail information about gelatine, I'm always having trouble with gelatined-food and now I think I'm feeling more comfortable about it..thanks! I always enjoy knowing the "why" in addition to the "how". My panna cotta felt a little too Jello-ie. I'm excited to try your method for making it. Your Indian-spiced panna cotta would make a delicious cooling addition to eat with a HOT curry. Oooh they are all amazing (as usual)! 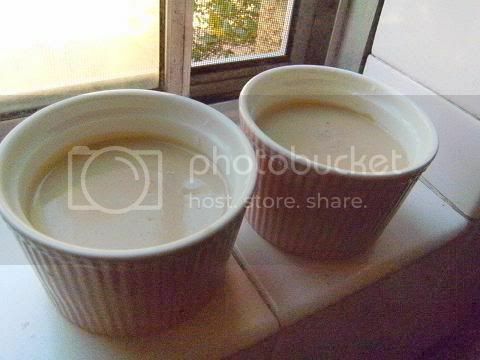 And I have long wanted to try a savory panna cotta and just love your mushroom version! And the texture on the coffee cardamom panna cotta is perfect! Fab job! Such creative ideas! Love the fun glasses and shapes. I love the multi colored and flavored one. Gorgeous! And it sounds delicious! Wow, Audax, I can't believe how many combos you tried. I love the cocktail glass versions, I really want to try Lime, pomegranate and lemon! Yum, I really want to try the cadamom one. Thanks for yor agar agar advice this past month. 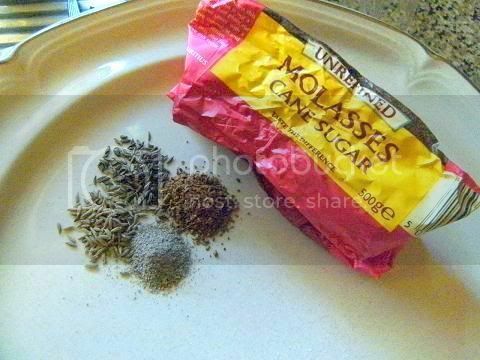 I have some powdered agar agar on its way to me, so I will try again without the flakes. Love those tall glasses! Chocolate panna cotta is next on my list. I am always amazed at your creativity with these challenges. 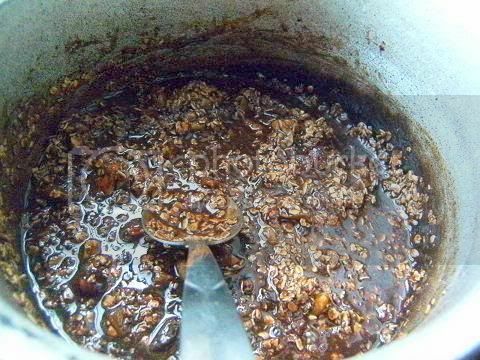 I have to say those spicy coffee pana cottas sound absolutely divine, although I wouldn't say no to the liquorice ones either! Will have to try and track down the liquorice root. Your panna cotta looks delicious! I'm quite a new Daring Baker, but the tips are as, as I guess, always, helpful and great!